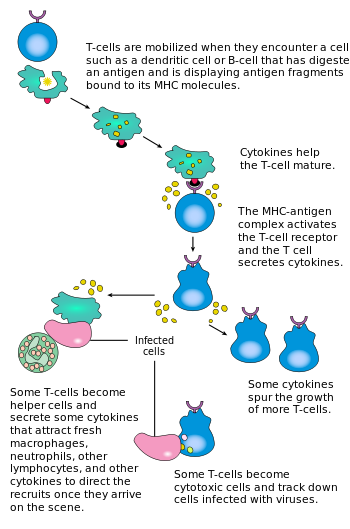 A diagram showing the activation of T cells. A T cell is a type of lymphocyte, a white blood cell. It plays an important role in the immune system by attacking virus-infected cells, foreign cells, and cancer cells. The "T" in T cell stands for thymus. The thymus is where T cells mature. This page was last changed on 26 November 2017, at 20:04.